Ocean Ritz, A Condominium, has two different floor plans to choose from. There are only three and four bedroom floor plans within this Panama City Beach condo and there are only 3 units on each floor. This is a very low density condo with only 63 units on just 21 floors. 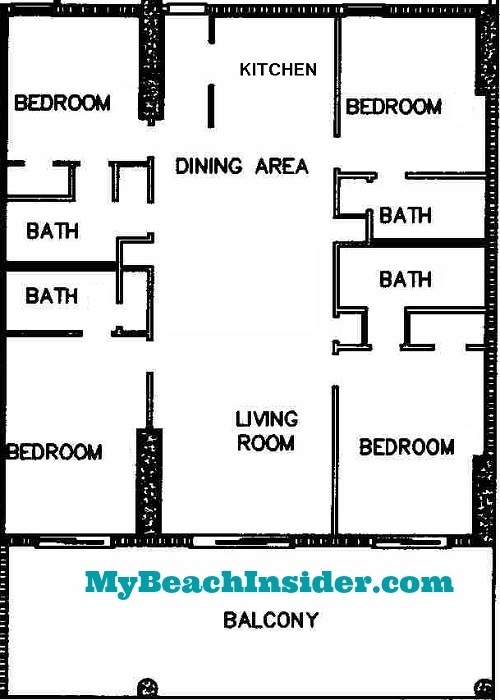 Ocean Ritz offers one three bedroom/three bathroom floor plan and it can be found in units that end in 02. It is in the center of the building and is 1,322 sq ft. The balcony is an additional 268 sq ft for a total of 1,590 square feet. As you enter the unit, you’ll find the first bedroom on your left. This bedroom has a closet and access to a bathroom. The bathroom is shared with the rest of the unit. Further down the entry hallway on your right is the second bedroom you’ll come across. This bedroom has a closet and a private bathroom. The bathroom includes a washer/dryer area as well as a sink, shower/tub combo and a toilet. As you continue down the hallway, the entrance to the shared bathroom is on your left and an AC closet will be across from it on your right. The shared bathroom has a sink, a toilet and a shower/tub combo. Continue walking into the unit and you’ll see the kitchen on your left. The unit will open up into the living/dining area straight ahead and the entrance to the gulf front master bedroom will be on your right, just after a small closet. The kitchen is separated from the living/dining area with a dining bar. On the far side of the living/dining area is a sliding glass door that leads out onto the gulf front balcony. When you walk into the master bedroom you’ll see a sliding glass door on your left and the master bathroom on your right. 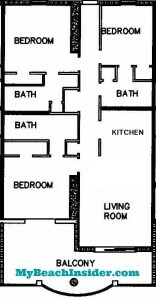 There is also a closet just past the master bathroom, also on your right. The master bathroom has his and her sinks, a shower/tub combo and a toilet. 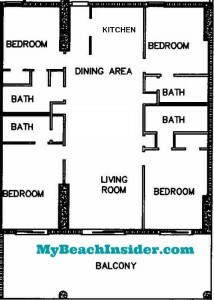 There is one four bedroom/four bathroom floor plan in Ocean Ritz at Panama City Beach and it also has a mirrored version. The version described below can be found in units that end in 01 and its mirrored version can be found in units that end in 03. These are both end unit condos with 1,637 sq ft of living area and a 493 sq ft balcony. As you enter this unit, you’ll see the kitchen on your left. Straight ahead, the unit opens up into the dining area, which is separated from the kitchen by a dining bar. On your right is the first bedroom. This bedroom has a closet and access to a bathroom that is shared with the unit. On the opposite side of the unit, you’ll see the second bedroom. It has a private bathroom with a closet, one sink, a toilet and a shower/tub combo. Walking further into the unit, you’ll see the hallway access to the shared bathroom on your right. It has a sink, shower/tub combo and a toilet. It also has a washer/dryer. Back in the dining area, the unit transitions into the living room. There is no physical separation between the living and dining rooms. 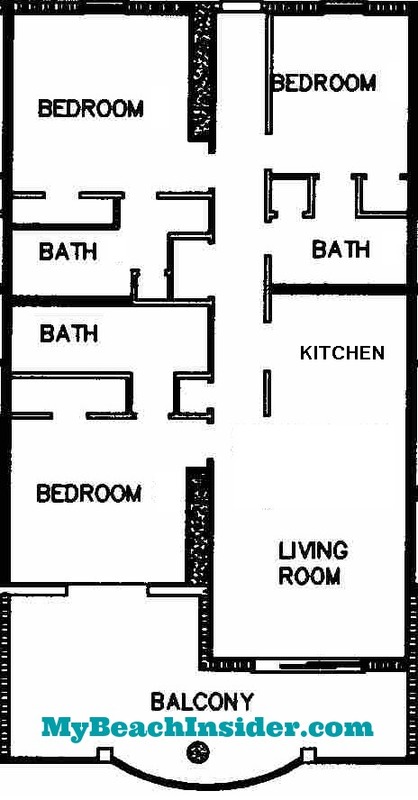 On the left side of the living/dining area there are two small closets (one of which is an AC closet) and on the right side of the living room there is one small closet. On the south end of the living room is a sliding glass door that leads out to the balcony. There are two gulf front master bedrooms off of the living room. The first is on the right side of the living room. As you enter this gulf front master bedroom, the sliding glass door leading out to the balcony will be on your left. The master bathroom will be on your right and it has a closet, a sink, a toilet and a shower/tub combo. The other gulf front master bedroom can be found on the left side of the living room. As you enter this gulf front master bedroom, you’ll see the sliding glass door leading to the balcony on your right. On your left, the first doorway is to the master bedroom. Just past that on the same wall is a closet. The master bathroom has two sinks, a toilet and a shower/tub combo. What Else Does Panama City Beach Have To Offer? Panama City Beach has a lot more to offer than amazingly beautiful beaches and great condos to stay in. Make sure you explore the rest of MyBeachInsider.com to learn more about the best places to eat, things to do and events that take place in Panama City Beach! If Ocean Ritz doesn’t seem like a good fit, you can learn more about other condos, too!